In a nutshell: There are some art shows, and some artwork, which no one (who cares how other “perceive” them) dares to write a negative review about because if a writer did dare to criticize it, he/she would be skewered by readers and others in the art world cabal’ PC police. It is essentially the PC’ing of the art world. I called it the “Quilts of Gee’s Bend Syndrome” because I first wrote about this curious self-policing of art criticism in response to a spectacular show that traveled the US many years ago to the universal acclaim of everyone who wrote about it in the critical press (including me), even though there were many art critics in that set of writers who’d rather dig their own eyes out with a teaspoon than actually “like” a museum show about quilts. The reason for that was that the amazing quilt show was about the work of the nicest, warmest, and friendliest set of elderly African-American women that anyone had ever met! In 2004, the Quilts of Gee’s Bend displayed the craft produced by the women (mostly) of Gee’s Bend, Alabama, a very isolated, small African-American community in southwestern Alabama. As one of the quilters put it herself at the press preview that I attended back then, “the road ends in Gee’s Bend and there’s nothing else past us.” Descended from the former slaves of two area plantations, the inhabitants of Gee’s Bend (who call themselves “Benders”) have been historically an agricultural society that was geographically isolated and nearly self-sustaining at a bare survival level through agriculture. And the women of Gee’s Bend not only plowed and planted and worked in the fields alongside their men, but also reared large families, cooked and kept house and made beautiful quilts; not as art, but out of necessity. These quilts first began to emerge outside Gee’s Bend in the 1960s, but around 2004 began making a true impact across the rarified upper crust of the fine arts world; a world usually too pre-occupied by what’s new, rather than “discovering” the art of common people such as the wondrous ladies of Gee’s Bend. Back then, The New York Times dubbed this show one of the “ten most important shows in the world,” and art critics who one would imagine would rather have their eyes poked out with a blunt butter knife than hang a quilt as “art” in their post-modernist flats all lined up to applaud this show and connect the bridge between craft and fine art for the Quilts of Gee’s Bend. Enter the two new game-changing portraits of former President Barack Obama (by Kehinde Wiley) and former First Lady Michelle Obama (by Amy Sherald), and other than a torrential deluge of really funny memes by Internet trolls, and several weird pieces by right wing authors who never before wrote about art, I suspect that we will not find a major mainstream art writer in America writing anything remotely critical of the two paintings. Why? Because the set of President and Mrs. Obama portraits are the “perfect storm” of the “Quilts of Gee’s Bend Syndrome” – I suspect that no one whose paycheck depends on writing art stuff for a living will dare to write anything tenuously negative about them, lest the PC police of the left wing let loose the dogs of word war upon them. But I noted earlier that they were simply paintings, and we can criticize a painting… right? For decades now, the top-of-the-food-chain art critics around the world have been declaring the death of painting, so we could start there, but since painting refuses to die, and stubbornly hangs on as the king of the money side of the art world where “art” is just another commodity, these two paintings are open to fair criticism, both positive and/or negative. Earlier on this saga, when it was announced that the very talented Kehinde Wiley would be doing the portrait of former President Obama, my first thought was “who else, but Wiley!” After all, he meets nearly all the “requirements” that someone checking off a list for the official portrait of America’s first African-American president would have: Wiley is a brilliant and intelligent artist, he’s a superb portrait artist, he’s a “hot” commodity in the art world, he nearly exclusively paints black people as his subjects, he has some disturbing art imagery in his past (he once cleverly – I say “cleverly” because it gathered him a lot of attention – twice portrayed a black woman holding the severed head of a white woman in an analogy of the Hebrew story of Judith and Holofernes) to tease the right wing, and he’s African-American. Wiley is the natural choice as the official portraitist for President Obama. And I was curious as to how Wiley had come across the President’s attention, and subsequently had been picked? I then asked a friend of mine who works at the White House, and who has been there since Dubya, in a position best described as “gofer.” I wasn’t sure if this WHG (White House Gofer) would know, but since I also know that he has a direct familial relationship to the DC art scene, I was not surprised when he “knew” how Wiley was selected from a list of potential artists (all African-American) that was, according to my WHG source, reduced to a couple of candidates and eventually the recommendation for Wiley all came from Presidential advisor Valerie Jarrett directly to the President. In spite of the giant hands that appear to be waaaaay out of proportion to the rest of President Obama’s body (and which make me think that Wiley possibly uses projection to achieve a good likeliness of his subjects) it was a great choice, and the Wiley portrait of President Obama has already done more for contemporary portraiture than anyone outside the art cabal realizes. In my opinion, it stands a chance to re-shape the “standard” for traditional portraiture and kick-start the National Portrait Gallery into the 21st century. 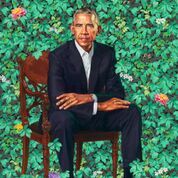 I really, really hope that the old-fashioned fuddy duddies who usually jury the National Portrait Gallery’s Outwin Boochever Portrait Competition take notice! 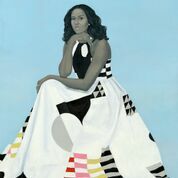 That’s it for my “criticism.” There are plenty of deeply analytical reviews of the Wiley “Obama” already printed on paper and in cyberspace, so next month let’s spend some time doing that for the even more interesting portrait of Mrs. Obama by the superbly talented (and Outwin Boochever Portrait Competition winner) Baltimore artist Amy Sherald. « Spring Into Fitness with these Tips!